This concept will be the first to leave the production line in 2011. With small size, a tiny price, zero pollution, fun and futuristic design, AIRPod mark a turning point in the range of urban vehicles while renewing the idea of the automobile and transportation. You can drive with a joystick, it only costs one euro per 200 km and leaves no one indifferent in crept in traffic. 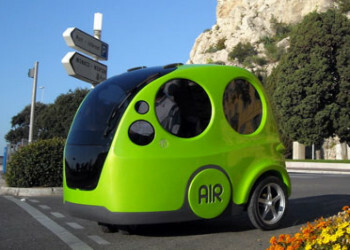 AIRPod is part of the MDI production licence of "less than 500kg vehicles", and is manufactured in the same factories as OneFlowAir, following the original production concept proposed by MDI.